UIT SV3000G2-L Series High-performance IP SAN / NAS storage systems powered by Intel's high-performance processors maximize return on investment with innovations such as green power saving, permanent cache caching, wizard-based configuration management, and more. 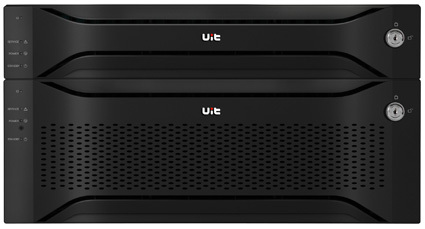 The UIT SV3000G2-L series is powered by Intel's high-performance processor-based high-performance IP SAN/NAS storage system, which maximizes return on investment with innovative technologies such as green energy saving, cached permanent backup, and guided configuration management. The unique SAT third-party storage application software embedded, can be integrated into third-party software, and more closely combined with the application to achieve a unified platform for application and storage. Green storage devices are an important part of building a green computer room. The SV3000G2-L series supports the multi-level MAID (Massive Arrays of Idle Disks) technology, which enables the disk to be activated during data access. It does not need to be active at all times to achieve power saving effect, which can save the user an average of 30%. The built-in MAID2.0 technology of the SV3000G2-L can reduce the frequency of access and effectively extend the disk life. 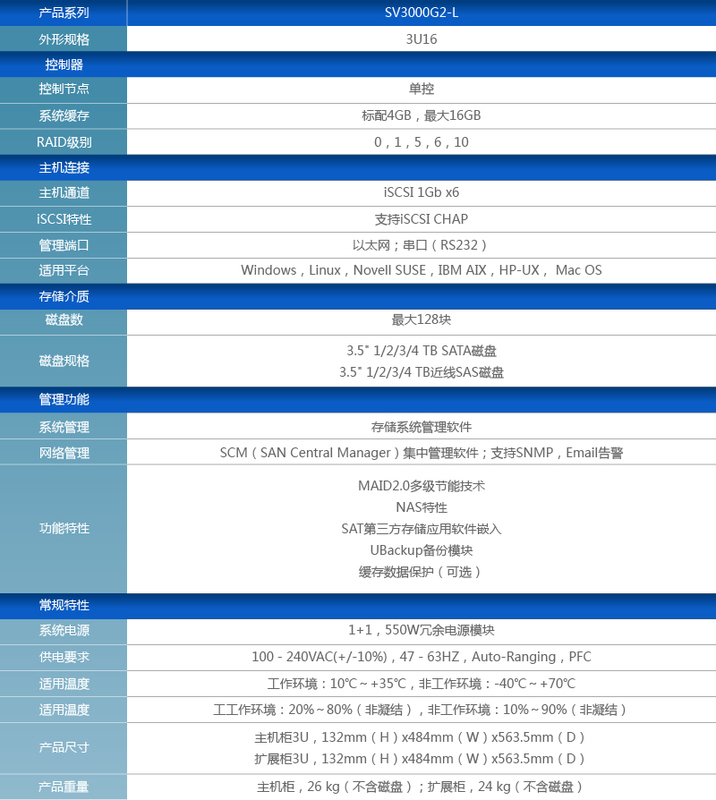 It is mainly suitable for near-line storage applications such as backup and archiving. The SV3000G2-L series features modular, fully redundant hardware design with failover, link redundancy and non-disruptive firmware upgrades to maximize business continuity. The innovative Cache backup technology will be used after the system is powered down. Cache data is written into the permanent cache to ensure that data is never lost. Accurate fault detection, isolation, and error correction provide higher system availability. SCM (SAN Central Manager) centralized management software can centrally monitor and manage the SV3000G2-L storage system from any location on the network, effectively reducing the management cost and manpower of the user storage system.